Deas and Anderson charge Lytle’s brigade, and it breaks under the pressure. General Lytle is mortally wounded. Command falls to Col Silas Miller of the 36th Illinois. Two of Anderson’s regiments also advance on Walworth. Just as Manigault is about to overrun the few units left at the Widow Glenn cabin, the 39th Indiana Mounted Infantry charges up the hill and pours several volleys into the Confederates with their Spencer repeating rifles, stopping them in their tracks. 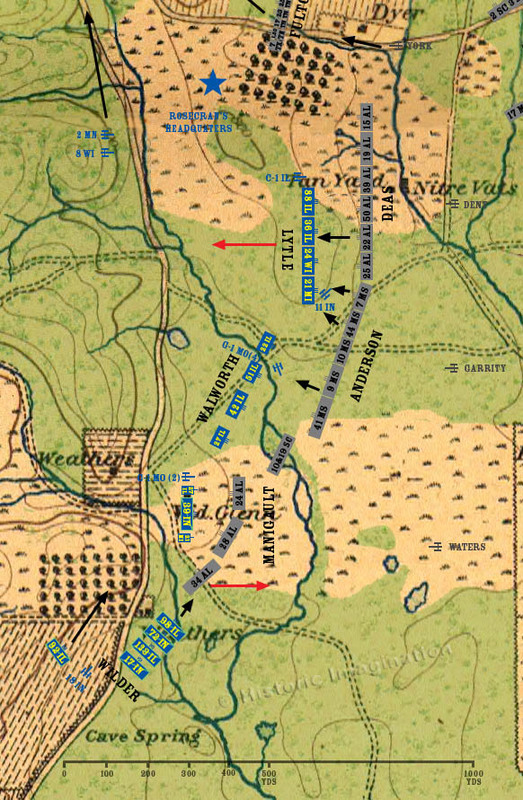 At the same time, the 98th Illinois charges and fires several volleys into the left and rear of the 34th Alabama with their Spencers, sending the regiment fleeing to the rear. Behind them, the 92nd Illinois reforms from their skirmish line, forms into line of battle, and advances to join the rest of the brigade.